We’d love your help. Let us know what’s wrong with this preview of A Surprise for Grandmother Rabbit by Barbara J. Smith. To ask other readers questions about A Surprise for Grandmother Rabbit, please sign up. A Surprise for Grandmother Rabbit. The book, A Surprise for Grandmother Rabbit, by Barbara Smith, is a delightful book about a good hearted little rabbit named Skipper. As he goes about running an errand for his mother, he ran into several friends who asked for a slice of the Cherry Pie he was taking to his Grandmother. Each friend has a special gift to give him in return as he goes on his way. By the time he reached Grandmother’s house, her pie was only half a pie. He felt bad about giving away A Surprise for Grandmother Rabbit. By the time he reached Grandmother’s house, her pie was only half a pie. He felt bad about giving away her pie. Then he remembered the gifts his friends gave him. He gave these to his Grandmother as well. Grandmother was wise. She appreciated Skipper’s big and good heart. She appreciated his willingness to share. But she realized that she needed to teach little Skipper to wait and get permission before giving something away that belonged to someone else. So she made an agreement with him to wait until he got to her house the next time before sharing with his friends and she would help him. Skipper liked the agreement and seemed relieved to know what to do next time. Grandmother helped little Skipper feel better about the situation by sharing her plans for all the gifts his friends had given him. He seemed surprised and thankful that she had a good plan for each gift. This little book teaches children several values such as honoring his mother, being friendly with others, respecting his grandmother’s request, sharing, helping. Little Skipper learns the lesson and skill of asking permission and respecting others property. The book is full of discussion material for the parent or grandparent to share with the child after reading the book. Skipper is a bunny with a fondness for cherry pie. He must see a cherry pie get safely to his grandmother’s house. His experiences along the way comprise the story. I read this story to my 5 and 3 year old grandchildren. They enjoyed the colorful illustrations. They were concerned about Skipper successfully getting the cherry pie to his grandmother. They were not convinced that he was going to get the job done. Smith successfully captured their attention and their concern regarding Skipper’s task. Skipper exhibited sharing and responsibility, always good lessons for this age child. The relationship Skipper has with his grandmother and his mother is well illustrated. This is a cute book and when I asked the 5 year old how she liked it she said, “I liked it, Skipper was cool.” I found the illustrations adorable; the three year old liked the bunny. It is a lovely and heartwarming story with beautiful illustrations. I little rabbit has to go visit his grandmother and bring her a hot from the oven cherry pie. On his way he meets several friends. They all want a piece of pie and they are willing to trade something for it. Kind little rabbit just cannot say no, so he ends up at his grandmother's house with some seeds, an acorn, worms, milk... and the last piece of pie! Grandmother scolds him gently, but saves the day by saying that she can use It is a lovely and heartwarming story with beautiful illustrations. I little rabbit has to go visit his grandmother and bring her a hot from the oven cherry pie. On his way he meets several friends. They all want a piece of pie and they are willing to trade something for it. Kind little rabbit just cannot say no, so he ends up at his grandmother's house with some seeds, an acorn, worms, milk... and the last piece of pie! Grandmother scolds him gently, but saves the day by saying that she can use the worms to catch some fish for dinner, plant the seeds to eventually make flour and bread from them, and an acorn can grow into a beautiful tree next to her house. Funny, as I was reading the story, I kept wondering if there was going to be any pie left for grandma, and there was! "A Surprise for Grandmother Rabbit" was a good childrens book. It has a wonderful way of teaching children about sharing with others. There is also a lesson in it at the same time about obeying your mother. It's important to learn both in life. It's best for children to learn these lessons at the earliest age possible. I really liked how this author bought these lessons together. I recommend anyone to read this book to their children! (Author of "The Adventures of the Muffin famil "A Surprise for Grandmother Rabbit" was a good childrens book. It has a wonderful way of teaching children about sharing with others. There is also a lesson in it at the same time about obeying your mother. It's important to learn both in life. It's best for children to learn these lessons at the earliest age possible. This is a sweet little story that a young child is sure to enjoy reading together with a grown-up over and over. You just know the main character, Skipper, is going to have an adventure when he sets off with a pie in hand. But it's an enjoyable adventure that plays out and young readers will identify with Skipper's need to make decisions along the way. The soft pastel illustrations are comforting and engaging, perfectly supporting the unfolding story. This is a book you should pick up for cozy r This is a sweet little story that a young child is sure to enjoy reading together with a grown-up over and over. You just know the main character, Skipper, is going to have an adventure when he sets off with a pie in hand. But it's an enjoyable adventure that plays out and young readers will identify with Skipper's need to make decisions along the way. The soft pastel illustrations are comforting and engaging, perfectly supporting the unfolding story. I was lucky enough to be a winner in a giveaway. Thanks again! Two lucky little girls(ages 7 & 1) now have the pleasure of enjoying this lovely little book. I loved that even after multiple reads, it doesn't become as tiresome as others I've come across. I agree with other reviewers that it's a bit reminiscent of others I've read as a child but that's a positivve thing for me. Why change a good thing? Overall, a good recommend for those learning to read and for younger children. Everyone can e I was lucky enough to be a winner in a giveaway. Thanks again! A Surprise for Grandmother Rabbit is a very endearing children’s book. The illustrations are wonderful and the story heartwarming with an important message hidden between the lines. Although Grandmother Rabbit doesn’t get all of her pie, her grandson actually helped her by ‘bartering’ pieces of it on his way to her house, so not only does she get one piece of the pie, she also gets lunch and dinner, and can start a garden. This would make a charming bedtime story to read to any child. I read this book to my friend’s children who absolutely loved the traditional way that the story was told and the brightly coloured pictures. It put me in mind of the stories I used to enjoy myself many years ago and should it have been around at the time I am sure it would have been one of my favourites. The artwork and colours are great and I especially like the picture in which the bunny meets the bird. The book also has a nice message, which I don’t want to tell here and spoil the story for o I read this book to my friend’s children who absolutely loved the traditional way that the story was told and the brightly coloured pictures. The artwork and colours are great and I especially like the picture in which the bunny meets the bird. The book also has a nice message, which I don’t want to tell here and spoil the story for other readers. This review has been hidden because it contains spoilers. To view it, click here. I thought this book was great fun to read. A very traditional story with good use of characterisation and descriptive language. There are plenty of fun, colourful illustrations that im sure any child would love. You even get a free audio book download. I think skipper the rabbit and his journey to grandmothers trading her pie for worms etc is something a lot of little boys would identify with, and maybe girls too! Thank you for choosing me as one of the winners of this book! This is a very sweet story that teaches children the importance of relationships with family and friends. It is a story that most children can relate to and one that I plan on enjoying with my second grade class. Thank you again! I am so happy to win this book! it sounds like it will be a fun read. I’ve been a freelance editor since the mid-1980s and have always dabbled in writing but have never actually put my skills to a test until now. My freelance editing background ranges from pre-school through college-level textbooks. Most of these projects involved mathematics, geography and some science textbooks at the pre-school through 5th grade levels, but I’ve also edited secondary mathematics I’ve been a freelance editor since the mid-1980s and have always dabbled in writing but have never actually put my skills to a test until now. My freelance editing background ranges from pre-school through college-level textbooks. Most of these projects involved mathematics, geography and some science textbooks at the pre-school through 5th grade levels, but I’ve also edited secondary mathematics and college-level textbooks on dance. At the same time I was a staff member at Princeton University. While there I was the managing editor for a scientific journal, Mammalian Genome. I later worked with pre-medical students at the University helping with advising on courses and med school applications while editing various publications dealing with pre-medical issues. Due to my husband’s employment we recently relocated to the Pocono Mountains of Pennsylvania. I retired early from Princeton University and was determined to use my extra time to write – finally! My first chidren's book was released in June. 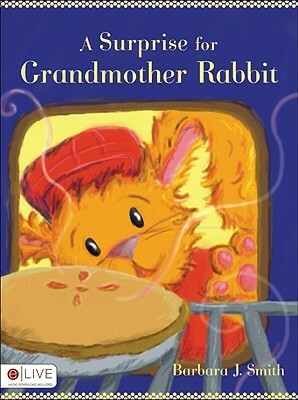 A Surprise for Grandmother Rabbit is geared toward children ages 4 to 8. Two granddaughters give me more incentive to write for children. They are hysterically funny and provide plenty of material for future books. We have three grown daughters living in Boston and Georgia. My husband Jeff and I enjoy the hiking, skiing, golf and photographic opportunities the Pocono Mountains have to offer. Travel is a favorite pastime. We have traveled extensively in Europe, including some Eastern countries. One of our more interesting trips was to Ukraine where our daughter was in the Peace Corps. Our retirement dream is to combine our love of travel with my interest in writing and my husband’s talents in photography. You’re never too old to have dreams.